President Cyril Ramaphosa (file photo). 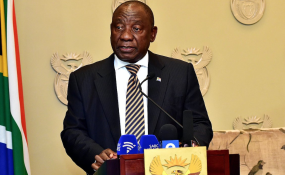 South Africa's new President, Cyril Ramaphosa, has been showered with praise for his early moves of fighting corruption. But he will need to do much more to win back investor confidence. Critically, Ramaphosa needs to display that wrong doers of former President Jacob Zuma's era are going to be held accountable through prosecution. Numerous academic studies, including mine, show that investors consider the effective execution of law and order as an indicator of property rights protection. For South Africa, this means that stabilising government debt and attracting much needed investment will entail both the investigation of corruption as well as prosecution of those implicated. Achieving this will prove impossible if investors aren't convinced that the rule of law is alive and well. He followed up by setting up outwardly focused initiatives to attract investment. These include the establishment of special envoys to attract $100 billion of investment into the country. These measures will go some way to fixing the wrongs of the past but they are far from sufficient. It's not enough for politicians who oversaw and actively contributed to the decimation of the country's social and economic fabric to simply retire from politics, move to new positions in the African National Congress (ANC), or be moved to other state departments. Similarly, reversing Zuma's legacy of state capture won't be possible unless the officials appointed by his ministers are also investigated and prosecuted. The latest reviews from global rating agencies are also unflattering. For example S&P has noted that South Africa's fiscal and economic trajectories are still very weak. As a result, the country is vulnerable to investor sentiment. This is being reflected in the weakness of the country's currency as investors dump domestic equities and bonds. The prosecuting capability of the state was in the spotlight recently when a court ruled against the state's Asset Forfeiture Unit in a case against the Gupta family. The judgement shows that the country's prosecuting institutions have been systematically compromised. And although a commission of inquiry into state capture has been set up under Judge Raymond Zondo, it's unlikely to wrap up its work in under two years. While there are many leaders with large public profiles that need to be investigated thoroughly for corruption, it isn't enough to fixate on the "top of the pyramid" only. Massive corruption needs many enablers, in both the private and public sector, to either actively participate in the wrongdoings or, at the very least, look the other way. This means that although a few high profile arrests and convictions can be useful signals to investors that concrete steps are being taken to reclaim the state, a much more robust process is needed to shore up the economy and South Africa's crucial institutions. Recent experiences from Brazil show that inquiries into state corruption can profoundly complicate economic recovery. That's more so if the slow pace of the court processes mean that politicians, officials and directors are not held to account expeditiously.